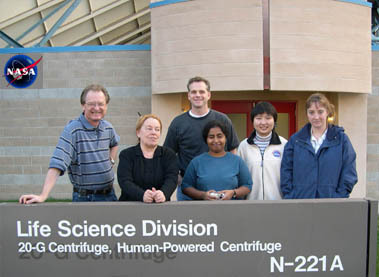 Helmut Hinghofer-Szalkay has spent one year at NASA's Ames Research Center in Moffett Field, California, and served as consultant for various international institutions, including the European Space Agency. In 1994, he established the Institute for Adaptive and Spaceflight Physiology in Graz, Austria. He won NASA-awards, and received the Yuri-Gagarin-medal from IMBP Moscow in 1999. Hinghofer-Szalkay H. Physiology of cardiovascular, respiratory, interstitial, endocrine, immune, and muscular systems. In: D. Moore, P. Bie, H. Oser (eds): Biological and Medical Research in Space. 1996; pp. 107-53. Springer-Verlag Berlin Heidelberg New York. Hinghofer-Szalkay H, Moore D. Some comments on biological aspects of life support systems. In: D. Moore, P. Bie, H. Oser (eds): Biological and Medical Research in Space. 1996; pp. 542-61. Springer-Verlag Berlin Heidelberg New York. Hinghofer-Szalkay H. Physiology - Introduction to Ch. 3. , pp. 94-5; Cardiovascular system, Ch. 3.2, pp. 95-102; Respiratory system, Ch. 3.3, pp. 103-11; Interstitial space & fluid regulation, Ch. 3.4, pp. 112-6; Endocrine system, Ch. 3.5, pp. 117-21; Immune system, Ch. 3.6, pp. 122-6; Musculo-skeletal system, Ch. 3.7, pp. 127-36; Cardiovascular system, Ch. 3.1, pp. 95-102; Bioregenerative Life Support Systems, pp. 409-11; Food, nutrition, metabolism, pp. 411-20; Countermeasures, pp. 420-6. In: Focused Science in the ESA Microgravity Programme - A Review of Life Sciences Research in Space; European Space Agency, Paris 1994. Hinghofer-Szalkay H. Human physiology research in space. Microgravity News 1991; 4: 21-8. Benson A, Bonde-Petersen F, Hinghofer-Szalkay H, Kirsch K, Klein KE, Milhaud C, Stegemann J. Physiology and Medicine. 1989; pp. 5-30. In: European Space Agency SP-1105. Hinghofer-Szalkay H. Gravity and biological systems. Emphasis on human physiology (N. Longdon, Ed.). ESA BR-21, 1984; 26 pp. ESTEC, Noordwijk 1984. Bonde-Petersen F, Hinghofer-Szalkay H, Hordinsky J. Microgravity as an additional tool for research in human physiology. 1982; 53 pp. European Space Agency BR-09. Hinghofer-Szalkay H. Tilt table and related studies. In: Zero-g simulation for ground-based studies in human physiology, with emphasis on the cardiovascular and body fluid systems. 1982; pp. 81-102. European Space Agency SP-180. 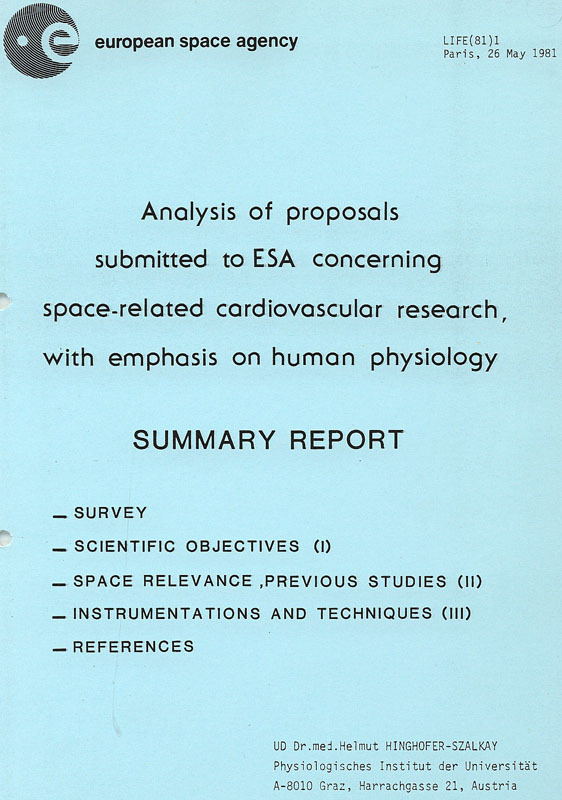 Hinghofer-Szalkay H. Analysis of proposals submitted to ESA concerning space-related cardiovascular research, with emphasis on human physiology. Life 1981; (81)1. European Space Agency, Paris. Greenleaf JE, H. Hinghofer-Szalkay, A Roessler, PA Farrell, JL Loomis, M Federle, J West, SE Cowell. Plasma sodium-osmotic dissociation and hormonal interaction with drinking-induced hypervolemia at 2800m altitude. Aviat Space Environ Med 72: 2001; 72: 522-8. Greenleaf JE, Geelen G, Jackson CGR, Saumet JL, Juhos LT, Keil LC, Fegan-Meyer D, Dearborn A, Hinghofer-Szalkay H, Whittam JH. Vascular uptake of rehydration fluids in hypohydrated men at rest and exercise. NASA TM-103942: August 1992. Greenleaf JE, Hinghofer-Szalkay H. Plasma volume methodology: Evans blue, Hb-Hct and mass density transformations. NASA TM 86834, Washington D.C. 1985. Hinghofer-Szalkay H, Rössler A, Scharfetter H, Pilz K, Laszlo Z. LBNP response after simulated weightlessness with varied oral sodium supply. Abstracts: 8th European Symposium on Life Sciences Research in Space, and 23rd Ann. Int'l Gravitational Physiology Meeting, 2-7 June 2002, Stockholm. ESA SP-501, p. 146Roessler A, Noskov V, Laszlo Z, Polyakov VV, Hinghofer-Szalkay H. Permanent depression of plasma cGMP during long-term space flight. Physiol Res 2001; 50: 83-90. Hinghofer-Szalkay HG, Laszlo Z, Roessler A, Haditsch B, Rothaler A, Unterlerchner M, Woellik U. LBNP-induced changes in plasma cGMP with and without head down tilt bed rest. J Gravit Physiol 1999; 6: P 105-6. Hinghofer-Szalkay HG, Noskov VB, Rössler A, Grigoriev AI, Kvetnansky R, Polyakov VV. Endocrine status and LBNP-induced hormone changes during a 438-day space flight. Aviat Space Environ Med. 1999; 70: 1-5. Grigoriev AI, VB Noskov, VV Polyakov, DV Vorobiev, IA Nichiporuk, HG Hinghofer-Szalkay, A Rössler, R Kvetnansky, L Macho. Dynamics of the hormonal regulation during LBNP sessions in (a) long-term space mission. Aviakosm Ecol Med. 1998; 32: 18-23. Loeppky JA, Icenogle M, Scotto P, Robergs R, Hinghofer-Szalkay H, Roach RC. Pulmonary ventilation during simulated altitude, normobaric hypoxia and normoxic hypobaria in humans. Resp Physiol. 1997; 107: 231-9.